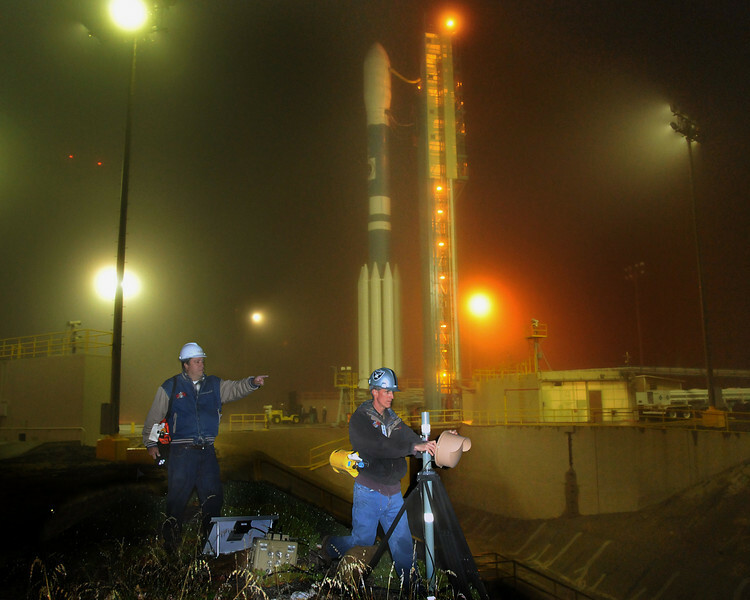 This is me and my technician at 5:30am the morning of launch hamming it up for the camera. I call this my "Magazine Cover" shot. Notice the breathing aparatus we have to carry when this close to the vehicle. Two photos taken 10 seconds apart, one with flash, one without, were combined in Photoshop so both we in the forground and the booster in the background could be properly exposed. Right after this photo was taken we packed-up this sensor on the tripod, the battery, the transmitter, and the solar panel because we are right on the edge of the flame duct where none of this equipment would survive the launch.